A fun and colourful game for children for children to learn 30 words for methods of transport in both German and English. This game features a set of 60 cards: 30 cards with an image of a method of transport and its word in English, and 30 card with the same image and its word in German. By matching the images on the two cards, children learn the words for different forms of transport in two languages. The game can be played alone or in groups and is ideal for home or classroom use. 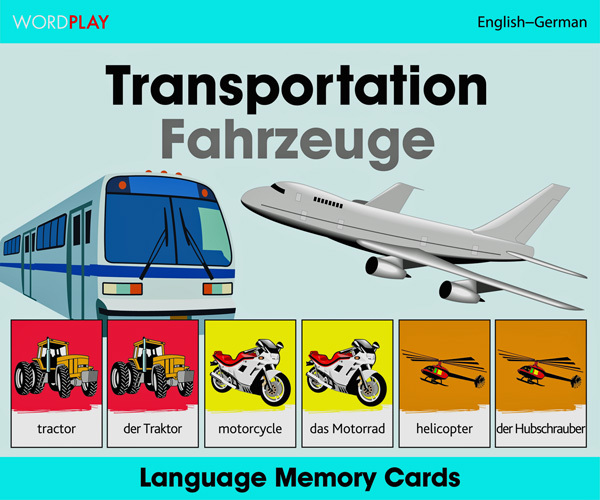 Language Memory Cards - Transport are ideal for children learning either German or English.